Enjoying Night-time During the Day! Master of Irony, M. Night Shymalan is in the building today to review our toy line for our upcoming movie, The Last Airbender (which you're all planning to see opening weekend -- July 2, 2010, right?). He's even more charming in person than he is on film! I think I am awfully close to convincing him to direct my life story! The new computer arrived today! LOVE it! I can surf, download, stream, and pretty much do everything faster with a brand spankin' new hard drive and HD compatible memory capacity! Look forward to more blogging, more often . . . it won't be so incredibly painful anymore, leaving me with no excuses. Hudson, on the way home from school today, "Mommy, why does Aunt Jessica have to live in New York?" Mommy, "because that's where she works honey". Hudson, "I don't want her to live there." Mommy, "where should she live?" Hudson, "in our house." .... I think he misses you! Well, I definitely miss him . . . I think I may need to start drafting my exit strategy. . .
After a brief business trip south of the border, I headed to CA for a long weekend to visit the fam and to see my nieces and nephews in action. Nicole (under my wise guidance and gentle nudging, I might add) made the high school volleyball team as a freshman and I couldn't be more proud! She was feeling down and out this week due to a chest infection, but she played long enough on Saturday morning for me to get a peek at her serving skills. She made sure to introduce me to her coach, who is "my twin; I swear!". Erin is lovely and after shaking hands with her, all of Nicole's fellow teammates kept giggling back and forth, "they do look alike! Oh my gosh! They totally look the same!" I don't see the resemblance, personally. . .
Kyle's team tied their opponents during this week's soccer match. And, despite avoiding a potential team pile up on the field, the coach was pissed at their underperformance of the day. Apparently, the reigning national champions think they don't need to work for a win these days . . . well, I am sure that after some extra laps in practice this week, they'll secure a win next week. Alison played great defense on Saturday morning and helped lead her team to a 4-0 win . . . she's doing great and is loving being a junior-high student. I spent Saturday night with Hudson; we played outside with his neighbor friends, enjoying the beautiful sunshine and warm weather we were blessed to have all weekend. My nose even got a little sunburned at the playground. I loved it considering it's been a blustery and cold October in NYC! My brother Bill took me to see his orthopaedic surgeon on Monday morning to get a second opinion regarding my ankle. After about 45 minutes of an onslaught of questions and a close examination of my MRI, Dr. Legome said very simply, "you have a lot of problems my dear, and I am sure you already know that." He continued by confirming everything I've been told, including the diagnosis of CMT and telling me that not only should I have the surgery, but that the quality of my life entirely depends on it. He then spent the next 15 minutes lecturing me on losing weight . . . as if I didn't already know that was an issue! I completely lost it then and there; I finally let all the fear, anxiety, and anger release from inside. . . I think I was still hanging onto a small sliver of hope or a medical miracle when Dr. Legome validated everything that I have been wanting to avoid. And, now that the right foot is hurting also, we asked if I should take the plunge and have both feet operated on at the same time. He thinks it would be far too traumatic for my body, so I have to make plans for how to address that foot sometime in the future. Thank goodness Bill was there to put his arm around me; I don't think I could have handled another doctor's appointment by myself. I managed to board the plane Monday night with dry eyes. . . I joked to myself that I think I am finally moving past denial and straight into anger! I'm progressing . . . definitely progressing! That's good, right? Finally arrived in Mexico City tonight at midnight after a really long day . . . I originally had a 9:15am flight out of JFK, but couldn't board the plane without el passporto~! Si, that's right; I left my passport at home in its hiding place instead of bringing it with me to el aeropuerto . . . damn you Homeland Security! What was so tragic about the situation is that there are only 2 flights every day between JFK and MEX. Hurriedly, I re-booked myself on the 6pm flight and decided to take the opportunity to get some work done at the office after stopping at home to grab my documentacion. You can imagine my overhwhelming feeling of respite when I finally arrived at my executive suite at the Four Seasons . 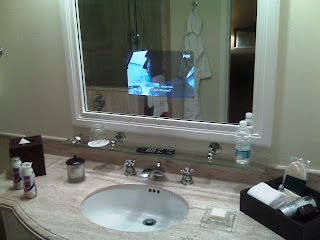 . . complete with an "electronic mirror" in my bathroom! That's right, I have a TV in my mirror! Love it and my job! Taking in the 3-D double feature of Toy Story and Toy Story 2 this weekend, I spotted Al Roker with his 2 kids in the theatre . . . he looked a little miffed when his son whined and begged to go home after only viewing the first movie. As you can imagine, he was not his usual smiling self . . .